I had a large group of artists over to my house to paint a few days ago. It was a cool, overcast day, which presents artists with opportunities to look outside of the box for subject matter, as well as giving us the gift of more consistent light throughout the day. 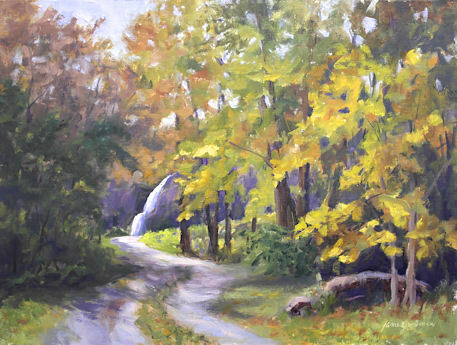 I selected a fairly complicated composition for this scene, which I might not have chosen on a day when the sunlight and shadow patterns would race across my scene in wildly conflicting directions! I’ve been pretty much sticking to the “Kenn Backhaus palette” lately, with the occasional additions of transparent red oxide (for convenience) and cerulean blue (to feed the blue gene of the color junkie within me). This painting contained both of those. I so enjoyed doing this piece while having time with my artist buddies. Great fun. For the bottom painting, I also used Nickel Azo Yellow, Quinacridone Burnt Orange, and Golden Acrylic Glazing Liquid to get a nice transparent glaze on the paper, then I worked into that glaze with the rest of the paints. I couldn’t resist stopping in my tracks to paint this pathway leading to a waterfall. 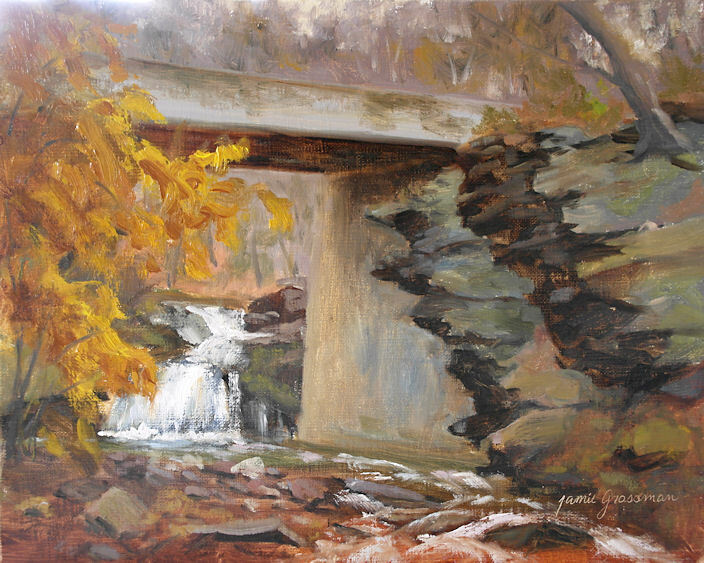 The fall foliage was nearly at peak, and the water gushed down the cliff face following a recent storm. Here is an image you can click on for a larger, clearer view. $175.00 plus $5 shipping and insurance within the Continental United States. For local sales, shipping charge will be allocated to NYS Sales Tax. Please email me at JamieWG@aol.com for International purchases or with any questions. 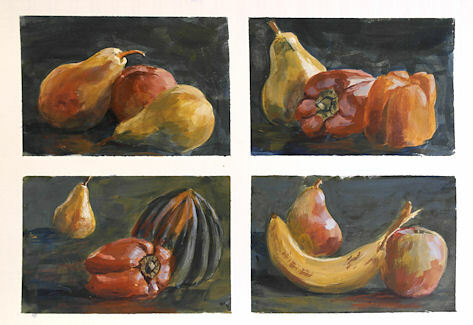 These four still lifes were done using a limited palette of Raw Sienna, Red Oxide, Prussian Blue, and Titanium White. It’s an interesting combination of colors that yields a beautifully muted color range with much depth. Unfortunately there’s some glare on the dark background, which is mostly a rich, deep green. They were done as design studies, but once I saw the four together on the page, I thought about how great they’d look together like this with a single mat and frame. 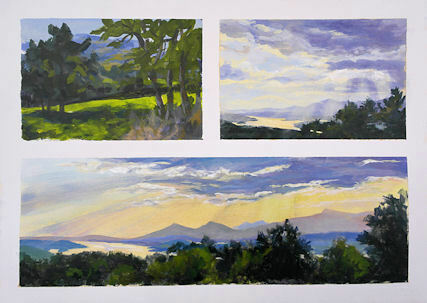 I’ve been painting up a plein air storm these last several weeks. I’ve been outside so much that it’s been hard for me to get into the studio to finish up the final tweaks on the paintings, photograph them, and get them posted here. 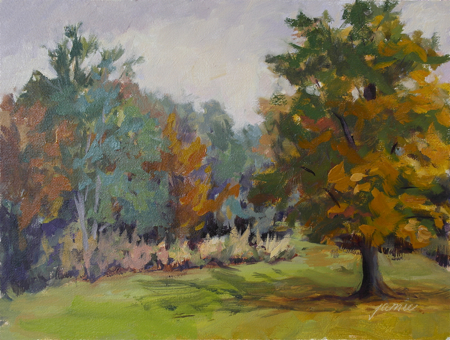 This is one I did from my patio a couple of weeks ago, with an on and off drizzle happening outside, and I put in a few final strokes this morning. The trees were displaying such a wide variety of fall colors, and I used the opportunity to study the colors and contrasts to the back of the property, where a path winds through the tree line.